Last night was a big night. August 28th, 2018, the 25th anniversary of Power Rangers. With this remarkable milestone in franchise history, we got a crossover special focusing on a blending of new and old that worked well, mostly. Overall, this episode is well-plotted and answers a lot of questions that have been lingering in the fan base for years, while confirming a few fan theories as well. Much of the episode focuses on the legacy of Tommy Oliver, the legendary Ranger who inspired so many others that came after, including using Tommy as both a villain and a rallying point. The setup of the episode involves a new villain, Lord Drayvon, who is trying to shatter the barriers in the multiverse using three Mega Arrows crafted by the primary villain of Super Ninja Steel, Madame Odius, in an attempt to build an army of Ranger robots and conquer each Ranger-inhabited dimension. Left to Right: Jeff Parazzo, Steve Cardenas, Li Ming Hu, Selwyn Ward, Steven Skylar, Ciara Hanna, Jason David Frank, William Shewfelt, Jordi Webber, Peter Sudarso, Yoshi Sudarso, Jason Faunt, Nico Greetham, Hayley Robbins, Chrysti Ane, Catherine SutherlandOver the course of the episode, we are treated to a great deal of action and teamwork, with most of the action footage of the Super Ninja Steel Rangers on their own having been lifted from Shuriken Sentai Ninninger: The Movie. The rest of the team scenes, or unmorphed scenes, are set in interiors or use a backdrop of flat gray walls and small areas, which serve the fight choreography extremely well. 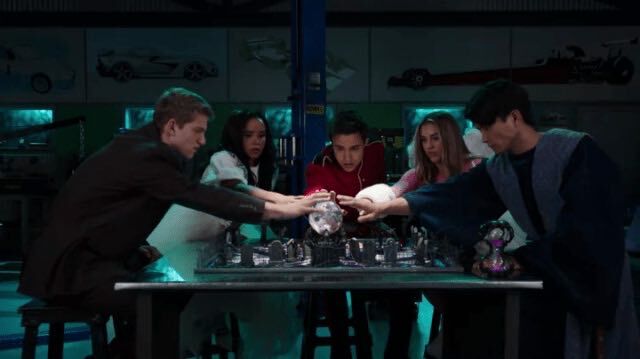 While not all the returning Rangers get a great deal of screen time, each has a purpose in the episode and all of them come together at the end to work with the Super Ninja Steel team. Without giving too much away, Tommy is able to play four out of his five previous Ranger forms in this episode, and we even get a well put together Tommy VS Tommy fight at one point, capped off by a larger battle between the thirteen Rangers and the Robot Ranger army controlled by Lord Drayvon. For the amount of material they had to work with in this episode, however, 23 minutes is simply not enough time. At points, it felt a bit rushed, certain plot points seemingly glossed over. The episode did answer many questions, though, such as confirming at long last that Dino Charge and RPM are indeed separate realities from the rest of the Power Rangers franchise. As stated by both Wes and Gemma, though, interdimensional travel is possible via the Morphin’ Grid, creating a possible link to the comics continuity and the story Shattered Grid as well. Could this mean Hasbro is laying the groundwork for the next film to tie all the universes together via an adaptation of Shattered Grid? It may be a bit early to tell, but one thing is for certain: Hasbro has big things in the works for our beloved franchise once they officially take full control with Power Rangers Beast Morphers, which is currently shooting and set to premiere in early 2019. Overall, I liked this episode and found it a fitting, if rushed, way to celebrate a 25-year history that is still being written and make sure the old Rangers return. What did you think of this episode? Leave your thoughts and let’s discuss! This lineup is confirmed via multiple official trailers, and a newly-posted morphing video shot behind the scenes on set and posted to the official Instagram page of veteran actor Jason David Frank. Coincidentally or not, you can see from this list that a large number of the returning actors are still highly active in the Power Rangers community and in interacting with fans at conventions and on social media. JDF, Ciara Hanna, and Yoshi Sudarso, in particular remain champions of the Power Rangers brand, devoted fans as well as vocal spokespeople. JDF and Ciara Hanna are also confirmed to be returning to their Power Rangers characters in a web film, Power Rangers Legacy Wars: Street Fighter Showdown, premiering later this fall. This team, as listed above, will be crossing into the universe and timeline of Super Ninja Steel to help them take on an army of enemies, made up of cloned Rangers, according to the trailers. This is eventful in another way, as well, as this will be the first time brothers Yoshi and Peter Sudarso, both blue Rangers for different teams, have appeared on screen together to battle evil. This special does raise several questions within the Power Rangers continuity, but with the existence of multiverse travel confirmed in the comics by Shattered Grid, it’s possible some of those questions may even be answered within the episode itself. Dino Charge and RPM each exist in their own realities, with RPM being a fusion of Terminator and Mad Max, while Dino Charge’s second season ended on the Rangers undoing the extinction of the dinosaurs, thus changing anything that would come after. With multiple universes worth of Rangers coming together, we are sure to be in for a good time when this episode premieres. Look for the 25th anniversary special of Power Rangers to air in a special time slot, 8pm EDT / 1am BST on Tuesday August 28th. Are you excited for this episode and what it could mean for the franchise as a whole? Leave your thoughts below and let’s discuss! Can you believe it’s been 25 years since the premiere of the original Mighty Morphin’ Power Rangers? A quarter century on, the series is still going strong, especially now that we are getting a glimpse at the franchise’s anniversary plans. Revealed first by IGN, including the picture seen below, the announcement was recently made that the second episode of Power Rangers Super Ninja Steel’s second half will be a 25th anniversary tribute, featuring the return of at least three former rangers. In the picture, we see Catherine Sutherland, Jason Faunt, and the legendary Jason David Frank, all morphing in a team pose. This means the characters of Katherine Hillard (here shown as Turbo Pink), Wes Collins (Time Force Red), and Tommy Oliver (in classic Mighty Morphin’ Green) are returning to the franchise for, at least, this one episode. Breaking from the series’ normal airing schedule of Saturday mornings, the 2th anniversary special episode of Super Ninja Steel is set to air in prime time, at 8:00PM US Eastern Time on 28th August, the original air date of the premiere back in 1993. IGN’s original article does also seem to imply that more Rangers will be returning, though they have yet to be shown. 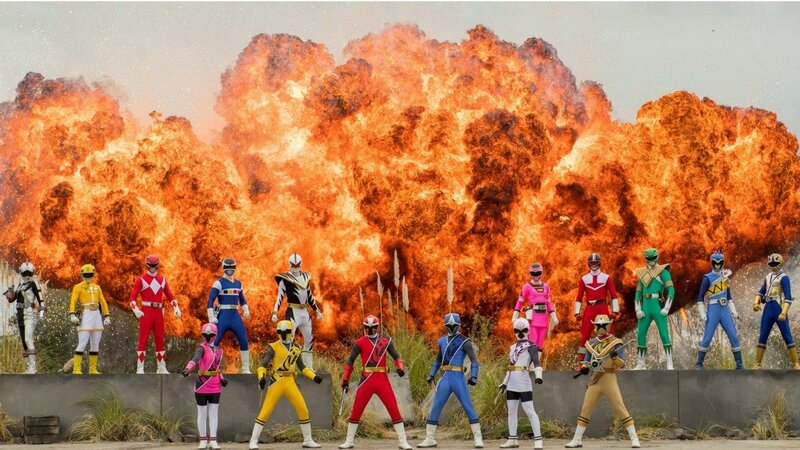 Crossovers in this franchise have a bit of a storied history, with highs such as the comics story arc Shattered Grid and the TV specials Forever Red and Thunder Storm coming in as highlights, standing in stark contrast to the Legendary Battle special seen in Super Megaforce. If you want to see more of these crossovers, each season of Power Rangers up to Ninja Steel can currently be found on Netflix in the US and UK, and Shattered Grid is available through most comics retailers and Boom! Studios online. Are you excited for this development? Leave a comment below and let’s discuss! We open on Gentoku in a familiar warehouse. He is shaking and groaning, presumably feeling the power of his Rider form as Rogue for the first time. The shot pans out and we see him fighting the Washio brothers. The ease with which he defeats them sets the scene, and we flash back in time three years. 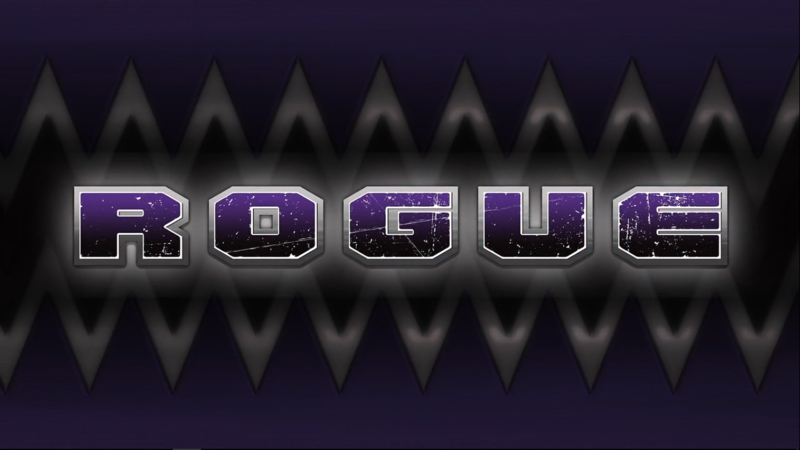 This is the beginning of the Prologue chapter: Night Rogue Rises. We are introduced to a new character, Hotei Koji, an aide to the Touto Prime Minister. Gentoku pleads with Hotei, who advises diplomacy and peaceful negotiation. Gentoku, even three years in the past, is not hesitant to rush into a fight. After making a threat, he is removed from Hotei’s office and ends up at a karaoke club. By way of an overzealous attendant, we learn Gentoku is a regular at this club and pays his way with government funds. Shortly after sitting down, he is interrupted by news that Katsuragi Takumi has begun an experiment on his own. As Gentoku arrives, Katsuragi is being pulled off of a Smash experiment subject, as guards try to shut the project down. On the phone with Hotei, Gentoku is told that he has changed since bathing in the light of Pandora’s Box, and remarks that the country is what has changed. He goes, not long after, to meet with Katsuragi in the light of day. Katsuragi has been fired by the Touto government, but seemingly only so he could he recruited by Gentoku to found Faust. Using the old Nanba research lab shown in the main series, Gentoku shows Katsuragi the familiar Faust base of operations. He commands Katsuragi to create the future arm of Touto, with the help of two assistants. Eager to begin, Katsuragi pays them no kind and we see a flash forward of a few months. With more personnel and more research, a Smash is created, and subsequently put down by Isurugi, using a Transteam gun. He calmly takes over Katsuragi’s terminal, and inputs the correct parameters for Nebula Gas usage on humans. Isurugi sees right through Gentoku now, as he does in the main series, and offers his allegiance. Another flashback sets up the weight Gentoku carries in a fitting way, as he watches his old life around him. Back at the karaoke bar, we see Gentoku and Hotei share a song, as they had when they were young men before the country split. After they finish singing, Hotei tells Gentoku he wants to resolve the conflict without fighting, knowing what a war would lead to. He also confides that he has been named successor to the current Prime Minister. Hotei departs, and leaves Gentoku with much to think about. A brief discussion leads to Gentoku strengthening his resolve to make a deal with the devil. A purposefully placed shot makes sure to show Gentoku literally stepping on Hotei’s body as he returns to the Faust base. He makes a speech to the scientists inside, and Faust is born. As a show of power to commemorate the occasion, Gentoku breaks the glass case holding the Transteam gun and Bat Full Bottle. He transforms into Night Rogue for the first time, and the credits roll. All in all, this is an excellent view into the early days of one of Build’s deepest characters, and begins weaving the web of complex storytelling and plot threads to come later. As this is part one in a trilogy, the ending of this special comes sometime before episode 1 of Build. For those wishing to watch the series in order after it is done airing, this will likely be the chronological beginning. What did you guys think of Rogue: Part 1? Are you excited for more? Leave a comment below! Zyuden Sentai Kyoryuger Episode.. 33.5?! The Kyoryuger love never ends! Zyuden Sentai Kyoryuger has an online episode that ties in with a mobile game! As if Zyuden Sentai Kyoryuger wasn’t popular enough, they’ve gone and partnered up with the mobile game “Brave Frontier” to bring us a new episode that ties directly into the game! Episode 33.5 is titled “This is Brave! The Battle Frontier!” and acts as a special tie-in episode with the mobile game Brave Frontier 2, which is to be released on February 22nd. The episode brings the Kyoryuger cast together after five years! 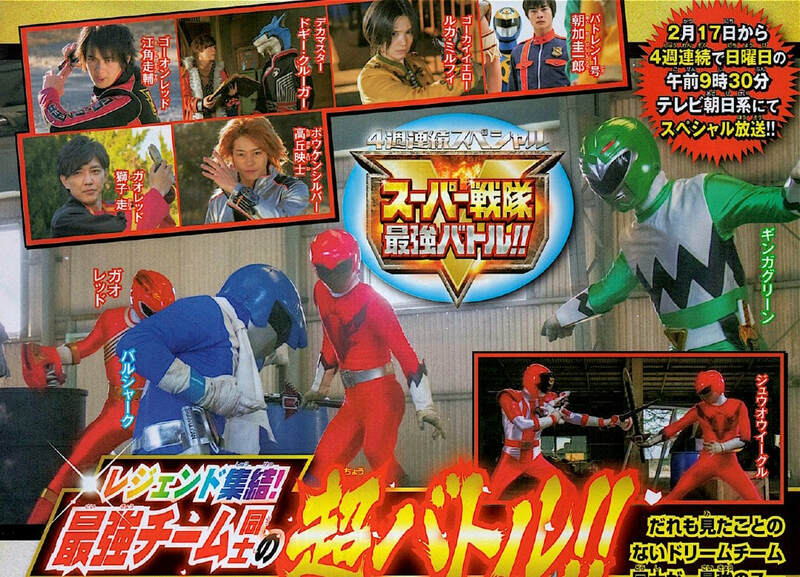 This also marks the second Kyoryuger spin off alongside Zyuden Sentai Kyoryuger Brave, the Korean counterpart to the dina-bite story! The cast even appeared in a very nicely done promotional trailer for the game itself, showing off their latest *ahem* .. attire. Details of the Kamen Rider Build YouTube Mini Series Revealed! Keeping with the recent tradition of having a YouTube special series at the beginning of the year that Ghost and Ex-Aid did Kamen Rider Build will be getting one as well. As it was teased back in the 2nd quarter toy scans for Build the special will be released next month titled “Kamen Rider Build: Raising the Hazard Level with 7 Best Matches” This will be a 2 part special to get a closer look at the other Bottles from the other regions in the show. 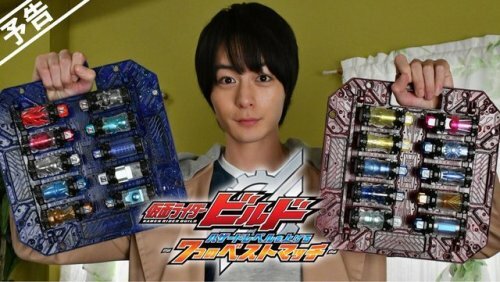 As the title suggests new exclusive Best Matches will be revealed for Kamen Rider Build that are activated with the Full Bottles from Hokuto and Seito. This special will also feature a large number of Full Bottles that don’t appear to have Build forms tied to them. The DX Full Bottle sets that go along with this special will be released between February and March for 800 yen each. The 10 Full Bottles shown on the Blue Hokuto Panel are Phoenix, Robot, Rose, Helicopter, Smapho (Smartphone), Wolf, Unicorn, Keshigomu (Eraser), Turtle, and Watch. Additional Hokuto Full Bottles that would go on another Blue Panel include Kuma (Bear), Televi (TV), Spider, Reizoko (Refridgerator), Kabutomushi (Beetle), Camera, Dog, and Mic. Not pictured in the special trailer but shown in the toy catalog is Scorpion and Gold to finish off the Hokuto. Of the Hokuto bottles, the special will focus on the Build Forms for PhoenixRobo, SmaphoWolf, and GoldScorpion. The 10 Full Bottles shown on the Red Seito Panel are Tora (Tiger), UFO, Kirin (Giraffe), Senpuki (Fan), Kujira (Whale), Jet, Shika (Deer), and Pyramid. Also shown on this panel are the Sai (Rhino) and Dryer Bottles, neither of which have any toy release at this point. Additional Seito Full Bottles that would go on another Red Panel include Penguin, Suekbo (Skateboard), Obake (Ghost), and Magnet. Also shown is the lone Hachi (Bee) Bottle which will be paired with Sensuikan (Submarine) Bottle. Neither of these Bottles along with Magnet have any toy releases at this point. Of the Seito Bottles, the special will focus on the Build forms for ToraUFO, KujiraJet, and KirinCyclone. For the final of the 7 mentioned Best Matches, Build will get the Same (Shark) and Bike Full Bottles to make the SameBike form. It’s unknown what region these Bottles belong to or how these will get any toy release. The Kaisers from Heisei Generations FINAL will also appear this time being white and green instead of Blue and Red. Finally, Build using the new Hazard Trigger will also use the SmaphoWolf Hazard form in this special. Part 1 of this special will be released on February 5th. Part 2 will be released on March 12th. Both on the official Toei YouTube channel. As always you can get all these new Full Bottles at TokuToyStore.com. What do you think of the new Build forms and Full Bottles? Wil you watch this special? Leave a comment down below! Power Rangers Ninja Steel Episode 16 Review. Ah yes, Halloween. When this spooky season comes around, we can be certain of 3 things; pumpkins, small children trying to rob you of your sweets and a big celebration from Power Rangers. You know the drill, a new PSA about how to not overdose on potentially poisoned unwrapped fun-size Dairy Milk bars (as we all do) and a halloween special. I don’t usually have high expectations for Ranger halloween specials since they don’t usually bring much to the story, even in seasons I usually really like. But this year, I was quite impressed. This halloween special was a really entertaining watch and it’s not something that would seem out of place in the rest of the season. The episode begins with the Rangers listening to Levi sing when they receive a mysterious board game. The Rangers go off to play it but Levi doesn’t want to come, because he doesn’t like board games. Levi isn’t that great of a character (I don’t need to remind you how Brody never got his burger in EP8) so him doing something like this isn’t a surprise to me but they kinda made it a big deal near the end. If they did this with a character like Brody, where it would be unusual for them to refuse something like this, it would come across as more mean. But I expect Levi to be a bit rude, making the lesson of the episode less relatable. The rest of the rangers go off to play the board game when it is revealed that it’s actually haunted. So Cosmo is controlling the game and broadcasting it as a Galaxy Warriors halloween special. That’s actually a really good idea, considering Ninja Steel revolves around another TV show it would make sense to have a halloween special in a halloween special. Also, Cosmo is a main focus of the episode. I actually really like Cosmo. Whereas Galvanax just felt like a discount Sledge, Cosmo’s charisma brought something new to the series that we haven’t really seen in awhile. It’s a shame he hasn’t really had much development (hence why I didn’t talk about him much when I did the EP1-12 recap), something which they actually gave a bit of to him in this episode. The object of the game is that the Rangers have to get to the end before the time runs out, every space represents a monster they previously fought and they have to fight them again when they land on their space. If the Rangers succeed in defending the monster, they get to roll the dice again. If they fail, the next monster gets a power up or the Rangers get a disadvantage. If the time runs out before the rangers get to the end, they have to give up their power stars. The Rangers aren’t allowed to leave the game or get any outside help. Overall, a pretty cool concept, having to re-defeat past monsters is an Idea that I like a lot and I wish it was done more often. The first monster they face is Trapsaw. Although the episode he was from is pretty good, he was pretty useless throughout it. I don’t know why they didn’t just use Ripperat, especially since we literally never see him placing any traps at all. It goes without saying that they defeated him quickly. The next monster was Hacktrack. But, instead of defeating him normally, Sarah used a really conveniently placed toolbox to create a device to stop Hacktrack’s hacking abilities. Considering that he was really hard to defeat originally, it makes sense that the Rangers chose a different way of defeating him. The next monster is Slogre. While the Rangers come close to defeating him, they get caught in the slow mist and lose the round, meaning they get a disadvantage in the next one. In this case, the Ranger that rolls the dice on the next turn has to face the monster alone. In this case, it’s Calvin facing off against Spinferno. Spinferno takes control of a truck, with the driver still inside, and drives it towards a cliff. To win the round, Calvin has to save the driver from falling. While he succeeds in saving the driver, he falls down the cliff and loses the round. As punishment for losing, the Rangers have to face a Skullgator and a brainwashed version of the Robo Rider Zord. When Levi (finally) realises that he was being a bit mean for having the Rangers do something that he enjoys while not joining in with something they enjoy, he goes to find the rest of the Rangers so he can join in their game. When the Levi finds out that the Rangers are in trouble, he goes to help them. Cosmo tries to stop Levi by claiming that he’s breaking the rules, but since he isn’t playing he doesn’t have to follow the rules. Levi uses his Zord star to free the Robo Rider Zord and form the Fusionzord to defeat the Skullgator. He then destroys the hourglass controlling the game time, freeing the Rangers. Despite my minor complaints and Levi being Levi, I really enjoyed this episode. It was cool seeing some of the season’s best villains and Trapsaw fighting the Rangers one more time and it’s nice to see Cosmo get more screentime. As I said in the recap, the show is definitely improving and this episode is proof. What do you think of this episode or of halloween specials in general? Let us know in the comments and have a happy halloween!